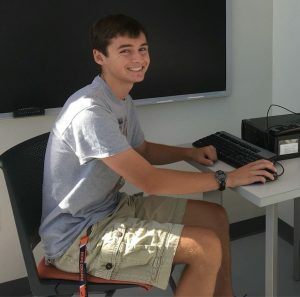 A typical semester for Hope College engineering student Samuel Bachwich (‘21) includes a full load of challenging courses across campus and long hours working on the Formula SAE team. During the fall 2018 semester he added one more activity to his schedule: Sam had the privilege of being a member of NASA’s inaugural L’SPACE Academy. Sam is passionate about spaceflight and space exploration, so when he heard about the program from Hope professor, Courtney Peckens, he applied right away and was accepted about a week later. Sam Bachwich working on CAD models for a Mars lander. As an increasing number of NASA employees retire, L’SPACE Academy is an attempt by NASA to prepare students for careers in the space industry. The academy is officially linked to NASA’s LUCY mission to the Trojan asteroids near Jupiter (projected to launch in 2021), and is two semesters in length, with the first semester being Level 1 of the program and the second semester being Level 2. Acceptance into Level 2 is partly contingent on each individual’s performance in the Level 1 group project, as well as, each group’s performance as a whole. Although it is not a class worth any college credit, the L’SPACE Academy does award a certificate to those that satisfactorily complete the program. The real benefit, though, is the extraordinary experience of learning from NASA engineers and the opportunity to work on a NASA directed project. During Level 1 this past fall, all participants used video chat software to meet one night a week throughout the semester to view a 90-minute presentation given by NASA. Each week featured a different speaker, including, leading engineers and managers from the Jet Propulsion Laboratory and NASA’s Mars Exploration Program. Participants (about 300 overall) were grouped into teams of nine students based on their time zone and fields of study and given a project for the duration of the semester. Last semester’s project was to write a Preliminary Design Review (PDR) document for a hypothetical mission to Mars. All science-affiliated majors in the group were tasked with determining a landing site for a Mars lander, a list of researchable science questions, and a short list of instruments that could be attached to the lander to investigate the generated questions. The engineering-affiliated students in the group were tasked with designing the lander and its descent system (meant to lower the lander from a height of 9 meters above ground to the surface). The lander came with a set of constraints: it could not have more than half a kilogram of mass, it could not cost more than $20, and it had to fit inside a cube measuring 30 cm to a side. The group project provided a wealth of experience. Sam contributed to designs for his team’s lander concept and was involved in drafting those designs in SolidWorks (making great use of his FSAE and CAD class experiences!). He was also involved in constructing the bill of materials for the lander, and contributed to the Preliminary Design Report. Overall, Sam found the L’SPACE Academy to be an incredible opportunity. He was exposed to new concepts and technologies, like NASA’s mission review process, presentations on NASA’s Mars Sample Return mission, and access to NASA’s JMARS software (the mapping software used for the Martian surface). He reported that the group project was an invaluable experience, “that taught me a lot about communication, initiative, and many more general career skills.” While he waits to hear if he will be accepted into Level 2, Sam is actively encouraging others interested in aerospace to consider applying for upcoming Level 1 sessions. Regardless of the outcome, Sam has gained clear confirmation that engineering for space applications is a career path and calling he wants to energetically pursue. Current students interested in learning more about the L’SPACE Academy can access the website here or see a sample presentation about the Mars Sample Return mission here.